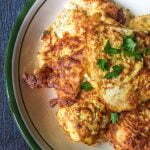 Chicken Romano with Lemon Butter sauce is a delicious gluten free, low carb and Paleo dinner. Easy to make and high in protein. If your chicken breasts are not already cut thin, cut to make thin cutlets and pounded thin. Sprinkle salt and pepper over your chicken. Put your almond flour in a large shallow bowl or dish. Dredge your chicken breasts in and coat each side. Heat a large sauté pan to medium high.Add 2 Tablespoons of olive oil and 1 Tablespoon of butter and heat until sizzling. In a separate large shallow bowl or dish, beat the eggs, water and Romano cheese together. Dip the chicken breasts in the egg mixture. Add the breasts to the pan and cook until browned on both sides. Move to an oven safe dish. Continue in batches until all the chicken is done. If breasts are thick you can bake for 10 minutes to make sure they are done all the way through. If they are thin you may not need to do this. In another sauté pan, melt 2 Tablespoons of butter and the juice of one lemon. Simmer for a minute or two and then pour over the finished chicken.